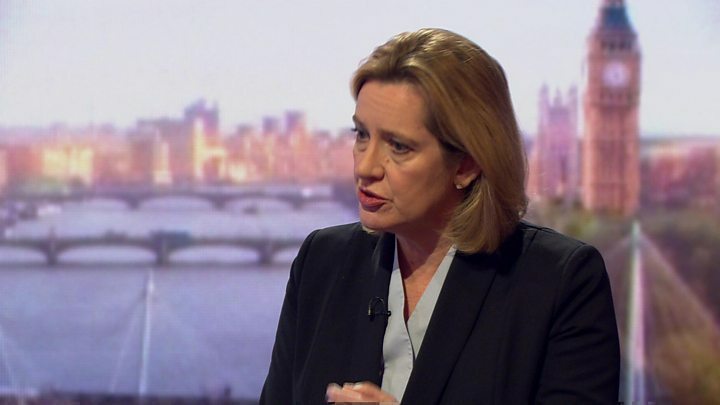 Media captionAmber Rudd: "Intelligence services need to be able to get into encrypted services like WhatsApp"
Speaking to BBC One's Andrew Marr Show, Ms Rudd said: "It is completely unacceptable, there should be no place for terrorists to hide. "We need to make sure that organisations like WhatsApp, and there are plenty of others like that, don't provide a secret place for terrorists to communicate with each other. "It used to be that people would steam open envelopes or just listen in on phones when they wanted to find out what people were doing, legally, through warrantry. Labour leader Jeremy Corbyn said authorities already had "huge powers". There had to be a balance between the "right to know" and "the right to privacy", he said. The Facebook-owned company, which has a billion users worldwide, has said previously that protecting private communication is one of its "core beliefs". Tim Cook, the chief executive of Apple which also uses end-to-end encryption, has previously said it would be "wrong" for governments to force Apple to "build a back door" into products. But Ms Rudd said: "I would ask Tim Cook to think again about other ways of helping us work out how we can get into the situations like WhatsApp on the Apple phone." Europol director Rob Wainwright echoed Ms Rudd's call for changes. "I would agree something has to be done to make sure that we can apply a more consistent form of interception of communication in all parts of the way in which terrorists invade our lives," he told Andrew Neil on the BBC's Sunday Politics. The victims of the Westminster attack were commemorated at the beginning of England's World Cup qualifier against Lithuania at Wembley Stadium. Before kick-off, four wreaths were laid in the centre of the pitch by Metropolitan Police Acting Commissioner Craig Mackey, London Mayor Sadiq Khan, FA chairman Greg Clarke and Culture Secretary Karen Bradley. A minute's silence was also observed by fans and players. Masood, 52, killed three people and injured 50 when he drove a car into pedestrians on Westminster Bridge on Wednesday. He then fatally stabbed a police officer before being shot dead by police - all within 82 seconds. Ms Rudd would not confirm who shot Masood, amid claims it was a bodyguard for Defence Secretary Sir Michael Fallon. Can the government access encrypted data? A provider could co-operate with authorities and decrypt data, says Will Knight, a senior editor at MIT Technology Review. But done properly, encrypted data can be difficult or impossible to access. WhatsApp maintains only those involved in a message can read the contents due to end-to-end encryption. There are sometimes "backdoors", Mr Knight says, and intelligence services have exploited those to retrieve the keys needed to decrypt messages. But backdoors may then be exploited by criminals, or hostile governments. Prof Ross Anderson, from Cambridge University, points out that if companies do co-operate, and try to keep quiet about it, it won't take long for the tech-savvy to cotton on. And criminals or terrorists will merely divert to one of the many other messaging services, based overseas, he adds. Scotland Yard has said it believes Masood acted alone, and while officers were "determined" to find out whether he had been inspired by terrorist propaganda, it was possible his motive would never be known. A 58-year-old man, who was arrested in Birmingham the morning after the attack under the Terrorism Act, remains in custody, while a 32-year-old woman arrested in Manchester remains on police bail. Eleven people were initially arrested over the incident and nine people in total have been released without charge.